The geomagnetic storm unleashed overnight by the biggest solar flare so far this year will not make a direct hit on Earth, but will strike more of a glancing blow early Thursday, forecasters at the Space Weather Prediction Center in Boulder, Colo., said this morning. Radiation from the flare is already causing blackouts of high-frequency radio frequencies used by aircraft flying over the poles, according to the center. The flare is categorized in the X-5 class; X is the strongest type on scientists' scales. There could still be some impact to power grids, radio communications and satellites from the geomagnetic storm- known as a "coronal mass ejection"- but experts say the effects should be relatively minor. As a precaution, however, power grid operators have been alerted and airlines are rerouting flights away from normal polar routes, said NOAA space weather scientist Joseph Kunches. The effects of the storm will last for about 24 hours, ending Friday, unless another flare appears in the meantime, Kunches said. Flares of this type, according to NASA, "are major events that can trigger planet-wide radio blackouts and long-lasting radiation." When they do make a direct hit, airline passengers and crews flying over the polar regions and even astronauts on the International Space Station are exposed to increased radiation levels. Power grids, even GPS systems can be affected. People along the U.S.-Canadian border will probably get a nice display of northern lights from this latest storm, although it's not yet clear exactly how far south you'll be able to see the show. "Aurora may be seen as low as New York to Wisconsin to Washington state," a space weather alert said. "You probably won't see them in Florida," said Bob Rutledge, a forecaster at the Space Weather Prediction Center. It's been a busy few days on the surface of the Sun. 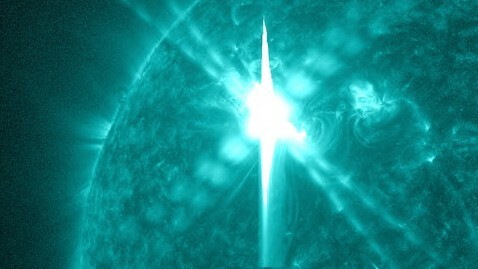 Another giant flare erupted on Sunday night from a sunspot known as AR 1429, which is many times larger than the Earth. The action is all part of an 11-year period of active sunspot activity that occasionally spits out powerful solar flares and geomagnetic storms. During a typical solar cycle, Rutledge said about 175 flares of the X-5 strength will burst from the surface of the Sun. We are currently in Solar Cycle 24, which astronomers say should peak in the next year or so.